Bodybuilding Roundtable Part 2: Developing Shoulders. I have a number of pros today who are going to share with us their strategies and routines for maximum shoulder development. Read this roundtable event and find out how they do it! If it is true that shoulders make the man, or women as the case may be, a fully developed and well conditioned set of deltoids will significantly add to the general appearance of just about anyone. In fact, when symmetry is scrutinized in a bodybuilding show, shoulder width along with a small waist, create the sought-after V-shape (or taper) that conveys an illusion of thickness and balance throughout the entire physique. It is widely thought that superior shoulder development enhances symmetry and physical presence, like no other muscle group. Granted, arms and calves probably rate as the more showy muscles compared to others, due to the impressiveness of their size and shape (if developed to their fullest extent). However, shoulders lend an impression of broadness to ones physique that can be seen under clothing and from all angles, making them one part that should be maximally developed. How does one go about training the shoulders for maximum impact? The answer is really not that simple, as there are a number of approaches and views on deltoid development. What is known, is that the deltoids are comprised of three heads (anterior, medial and posterior), and equal training attention should be applied to all three of these heads, for complete development. The Three Heads Of The Deltoids. In other words, shoulder training can be complex due to the range of exercises, and sheer volume of work, needed to effectively target the entire deltoid grouping. So we know that volume and balance are important aspects of shoulder training, but what strategies and pointers might help to specifically target the delts? This week, pro&apos;s Shawn Ray, Eryk Bui, Wong Hong and Guy Grundy discuss how to develop this important body-part and share their personal workouts tips and training strategies. 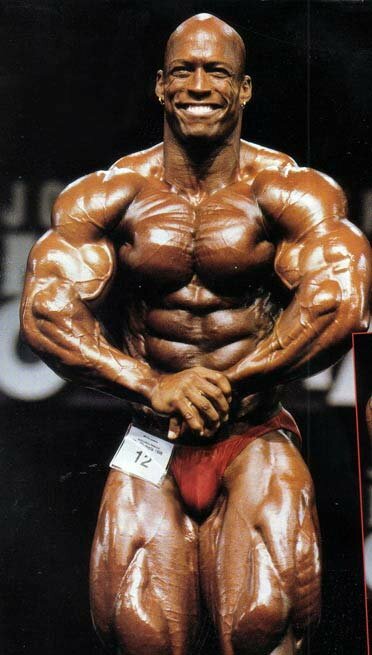 Anybody even remotely interested in bodybuilding should know who Shawn Ray is. Shawn, a multiple top-five Mr. Olympia competitor and bodybuilding spokesperson, exemplifies mass with class due to the combination of mass and aesthetic qualities his physique presents. Shawn&apos;s shoulders - both massive and complete - never failed to impress on the Olympia stage. An Interview With One Of Professional Bodybuilding&apos;s Greatest, Shawn Ray. Malaysian born Wong uses his vast training knowledge, to train himself and his many clients. Wong is well on his way to owning a chain of gyms throughout Malaysia, where he can demonstrate exactly how he has developed one of the best physiques on stage today. A proponent of ultra-strict training, Wong developed his shoulders to such an extent, they are now among the best in the world. Australian born Guy has been training for 22-years, during which time he has built an amazing physique, complete with full, round, shoulders. The personable Guy is a very popular bodybuilder as he speaks his mind and has tremendous respect for his fans. When 2004 Nationals champion Eryk Bui competes on the pro stage, he is sure to make an impact. Combined with a small waist, Eryk&apos;s shoulders create an impression of extreme width onstage, and in person. He is sure to go a long way. An Interview With 2004 Nationals Middleweight Winner Eryk Bui. Eryk gives an exclusive account of his thoughts on the current state of the sport, his goals, and the training and nutritional approaches he has adopted. What Type Of Training Split Do The Featured Pro&apos;s Use? Training shoulders at a higher frequency and with a larger number of exercises [compared to other muscle groups] is one of bodybuilding&apos;s unwritten rules. Although there are many different approaches to deltoid training, volume and frequency seem to be standard practice. The experts share their views below. Eryk Bui considers his split to be unusual compared to that of other bodybuilders, but it obviously works for him. "I train shoulders along with triceps. As for frequency, I train shoulders twice a week: on Tuesday and again on Friday. My split is a bit unusual but it works for me." When he competed, Shawn Ray trained shoulders twice a week. "I did a three on one off with shoulders twice a week. Usually I train chest in the arm and shoulders in the pm." Another who trains shoulders twice a week, in the mornings, is Wong Hong. "I train shoulders in the morning and biceps in the evening. I train shoulders at maximum intensity twice a week." Like Wong, Guy Grundy trains shoulders with biceps. However, he only trains them, as a whole, once a week. Rear deltoids are also done on back day. "I train only three times a week and each workout will last approximately. 1 hr at the most. I found training shoulders with chest took too much out of my front delts. "I only train each body part once per week. However, I will do a few lights sets of shoulders on day three to get a little blood in the side delts, and I always do additional rear delt work with back and traps as they get worked indirectly while training these muscle groups." Current Shoulder Training Routines The Pro&apos;s Use. It is not surprising that, compared to smaller muscle groupings, shoulders require a greater stimulus. Multiple sets, and exercises are the order of the day. The pro&apos;s elaborate. Guy Grundy has leared his shoulder training strategies the hard way. After injuring his shoulders many times [which led to three shoulder surgeries], Guy knows how to adequately stimulate his delts, while remaining injury free. "I will do approximately 10 minutes of stretching and warm-up exercises. The shoulders are the most unstable due to being a ball and socket joint. After three shoulder surgeries I know first hand, how bad shoulders can ruin a career. Once I am warmed up and feel ready to roll I will get busy." "I start with seated dumbbell side laterals and I will vary the reps anywhere from 10 - 20. I do not drop my reps lower than this for any body part. I will do three sets in total. "I may use some drop sets if the weight does not allow me to get the number of reps I am aiming for that particular day. Being seated prevents me from using body swing and momentum. Once again I will keep my reps between 10-20." " Low Pulley Side Lateral. I will hit the side delt once more as this is the area that gives you the illusion of having wide shoulders, and the cannon ball appearance which is a must in today&apos;s level of competition." "I will finish off with some light shoulder presses to the front. These are more of an isolation warm down exercise for me. I find I get all the front delt work I need when I train chest." Click Here For A Printable Log Of Guy Grundy&apos;s Shoulder Workout. Eryk Bui believes in power movements in addition to refining exercises. He works up to some very heavy poundage&apos;s, ensuring strict form throughout. "I basically took two shoulder movements ( Power Clean and Over-head Press) and combined them into one power movement that requires maximum intensity to accomplish. I like to combine traditional lifts from power-lifting and bodybuilding together to create "the ultimate" movement. My poundage increases as follows: 135 X 10 (no press), 185 X 10 (no press), 225 X 4-6 (with press), 225 X 4-6 (with Press)." "As the weight gets heavier, the reps decrease accordingly. I use the first set to establish my range of motion. Sets two and three are the most intense. I play by ear on the 4th set. If I am exhausted, then I finish with high reps. If I still have some left in my tank, then I go a third high intensity set. My poundage is as follows: 100 X 10, 115 X 10, 125 X 10, 125 X 10." "My poundage is as follows: 60 X 12, 80 X 10, 90 X 10, 100 X 6-10." "I use the same "moderate" weight throughout this movement. Performing bent-over barbell rows on my back training day covers the rear delts additionally." Click Here For A Printable Log Of Eryk Bui&apos;s Shoulder Workout. Because of the emphasis he places on power movement, Eryk has realized tremendous growth in his frontal deltoids. "The anterior or the front part of my shoulders have been easiest to develop because my power movements (Power Cleans, Over-head Barbell Presses, Over-head Dumbbell Presses) target that area the best." "Additionally, when I perform an inclined chest movement, I hit some anterior delts, because of the range of motion. I consider myself a hard-gainer when it comes to shoulder development. It takes a lot of heavy pounding on them to get a growth response. People tell me otherwise, but I am my toughest critic... it&apos;s never enough." Shawn Ray has adopted a less intensive approach to shoulder training, since retiring from bodybuilding competition, only training one day a week as opposed to two. "I train shoulders once a week over a five day spread. Four exercises, three sets each. Medium weight, low intensity for general fitness, not size, are my current guidelines and the exercises I use are dumbbell press, side laterals, bent laterals & upright rows." Click Here For A Printable Log Of Shawn Ray&apos;s Shoulder Workout. In the throes of developing even more size, Wong Hong uses drop sets for added intensity. His poundages [not included] vary. "My usual shoulders workout is as follows." Click Here For A Printable Log Of Wong Hong&apos;s Shoulder Workout. * Denotes a drop set. "Immediately after the set, I grab a lighter weight and crank out a few more extra reps."
** Denotes double drop set. "After a performing a drop set, grab an even lighter weight and continue doing a few more reps till failure... ouch!" What One Movement Contributes To The Most Size? With shoulder training, one common theme seems to exist: multiple movements are needed for complete development. But is there one superior movement? The pro&apos;s think so. For Wong Hong the most basic shoulder movement in existence proves beneficial. "The seated Military Press has built most of my size. This exercise is the meat and potato movement for building shoulder mass. It should be included in all shoulder routines." To The Most Basic Of Shoulder Movements. For Shawn Ray shoulder width rates highly. "Side laterals. This one really gives the delts a bulge and cap to the shoulder, which helps accentuate the shoulder/waist taper." Shawn Ray, Side Lateral Proponent. Guy Grundy has similar thoughts to Shawn regarding the best overall exercise for shoulder size. "Without a doubt that would be the side laterals. I like free weights, cables and machines for these. I believe this is by far the most important exercise for developing the side head of the delt region. "The rear delts are also a major one as they give you the look of thickness from the side. A nice pair of traps and some meaty rear delts really add a different look to this area." What Are Some Of The Best Shoulder Training Techniques? All of us have a unique approach to training. In fact, no two training programs are really the same, when one considers incidentals such as rest between sets, angle of movement and technique. The pro&apos;s share techniques that have worked for them below. For Shawn Ray, mind over training technique does the job. "I would say visualization is the most important technique. I picture the way I want my Shoulder to look before I pick up a weight. 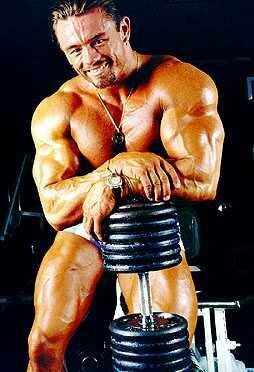 I picture other bodybuilders that have great delts as a form of motivation - Levrone, Strydom, Haney for example - these guys I picture in my mind while I attack my shoulders!" Visualization: Make Each Rep Count! Do individuals who train half as hard as you and make twice the gains frustrate you? It&apos;s all about elbow rotation for Eryk, who feels injury prevention and strict technique contribute to great shoulder development. "On an overhead movement, I have found it safest to keep the elbows turned in slightly instead of keeping them out. I have a strong physical therapy background so I have worked with many sports-related injuries. A common injury that I see involves the rotator cuff. I strongly believe that the rotator cuff as a whole is at risk when you don&apos;t turn the elbows in during an over-head movement. As a rule of thumb, I turn them in so that my elbows are not pointing straight ahead or straight out to the side - 45 degrees between those points are best." Wong Hong supersets for an intense pump. "Supersetting seated military press with a one-arm dumbbell press is effective and brutal. For me, this is the best and fastest way to pump blood to my shoulders area." An emphasis on technique over heavy weights is the ideal approach for Guy Grundy. After injuring his shoulders [and the ensuing 18-month training layoff], Guy has found that longevity in the sport comes at a price. He now uses a more sensible weight. "Don&apos;t lift heavy as the shoulders are involved in so many exercises and various sports and are continually abused and overtrained as a result. Paul Dillett ruined his shoulders which eventually made it next to impossible to train as required and to continue on in the sport. 18 months due to all my shoulder problems and surgeries. Don&apos;t let this happen to you!" What Is The Best Way For A Beginner To Develop Their Shoulders? As with all muscle groups, a different approach is needed for the beginner as compared to the more advanced lifter. Extra emphasis needs to be placed on safety, as the shoulders are susceptible to injury, due to their structure and the types of exercises needed to work them from all angles. The pro&apos;s give their advice for the beginning lifter. Eryk Bui believes in listening to ones body, adequate rest, and strict technique during the early stages. "Start light and establish perfect mechanics first. Once you are able to perform the movements with proper range of motion without thinking about it, then move up in resistance accordingly. "Also, listen to your body. I train shoulders twice a week so when they are sore, I back off of the intensity or even take an extra training day off to let them recover. I look at every workout as an opportunity to make a huge difference in my physique. Therefore, I have to make sure that I am capable of giving 110%." The beginners program Wong Hong suggests is very basic, yet highly effective. "For beginners, I would suggest the following shoulders program." Click Here For A Printable Log Of Wong Hong&apos;s Beginner Shoulder Workout. Complete training is the approach Shawn Ray suggests for the beginner. "Train them holistically, meaning from every angle with the purpose and mind set of making them bigger and rounder. This can only be achieved by training all four heads of the delt with specific exercise that hit every head." Once again, Guy Grundy suggests listening to ones body and feeling the movement from start to finish. "Stick with the basics and learn to use correct form from the word go. Check your ego at the door and feel the muscles being worked. "The old saying of go home or go heavy is a thing of the past in today&apos;s modern age of the sport. If you body is injured it cannot grow and improve. Listen to your body, it is talking to you!" Now we have gained a reasonable understanding of how to work the shoulders for impressive results, it is worth noting why the pro&apos;s feel perfectly developed shoulder are advantageous. Having a well developed set of shoulders is very important in competitive bodybuilding suggests Wong Hong. "A well developed set of cannon balls will accentuate one&apos;s symmetry. It makes the bodybuilder appear wider and hence his/her waist would look smaller especially in the standing relaxed position." With A Well Developed Set Of Cannon Balls. Known for his impressive V-taper, Shawn Ray feels developing the shoulders adds to ones symmetry. "The advantage is that big round delts segway into the shape of the rest of your physique. They set off your shoulder waist ratio and they tie in to your back double biceps shot. They carry the weight of the rest of your body. Big delts equal Big Results!" Big Delts Equal Big Results. Well, the ladies do love a great set of shoulders. However, Guy Grundy also reckons they complete the physique as they can be seen from all angles. "Well, the ladies like a well developed set of shoulders so that was all the motivation I needed when I was a young buck! LOL. Seriously the shoulders are a muscle that can be seen from all angles and they provide the illusion of having great width. Shoulders set the physique off, along with back and legs, shoulders are the areas you need to have fully developed to be a threat come competition day." This discussion has uncovered many common strategies that are sure to work for most lifters. It has also provided some unique insights into how one can develop the deltoids to their genetic potential. Indeed, there is nothing that compares to learning from those who have done what many of us aspire to. The pro&apos;s featured in this article are, or have been, in one way or another, the best in their chosen profession, and I would like to thank them for their professionalism and honest answers. The common themes that emerged from their discussion follow. 1. Train Shoulders Twice A Week (For Advanced Lifters). Given the complexity of the shoulder grouping, it is advised that they be trained twice a week to ensure they receive adequate stimulation. The pro&apos;s seem to agree, and I personally have found that training them once with chest and again on their own, works better than training them just once. The shoulders just seem to thrive on volume. However, it is also important to ensure correct technique at every session, and a backing off from heavier weights (perhaps implementing light weights for one session every second week) on occasion. It goes without saying the strict technique is mandatory when training shoulders, as they are probably the most injured structure among bodybuilders. All the featured pro&apos;s agree: strict technique should be used at all times. 3. Use A Variety Of Exercises. As mentioned, the shoulders have three heads, all of which require a specific training stimulus. In order to achieve this, a variety of movements need to be used. Various lateral and pressing movements usually predominate, with front raises and cable movements being great finishers [and in some cases good mass builders]. The pro&apos;s all agree that the basics should come first, with the more advanced movements [like cable side laterals] later. 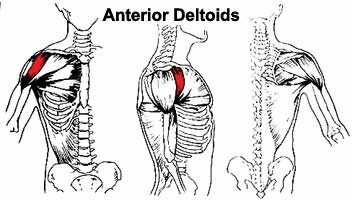 When fully developed, the deltoids look good from all angles. Thus, they need to be trained from all angles. 4. Make Side Laterals & Barbell Press The Foundational Exercises. Of the large range of exercises needed to effectively develop the deltoids, side laterals with dumbbells and barbell presses are thought to be the best. These have probably contributed to more shoulder growth than any other movement. 5. Do Not Lift Excessively Heavy. With the big compound exercises like squats and deadlifts it is safe, indeed advisable, to lift very heavy [with correct form]. However, with shoulder movements, weight should be kept moderate, until perfect form is developed. Even upon perfecting the movement, the weight should not be excessive, as the shoulder joint is quite vulnerable and susceptible to injury, as a result. Feeling the movement with a lighter weight as opposed to heaving a heavy load, is also more beneficial in terms of developing the deltoids. Keep movement smooth and train for the pump.